And if it's going to be shared might as well be via www.uselessramblings.com - the blog could use some gravity. 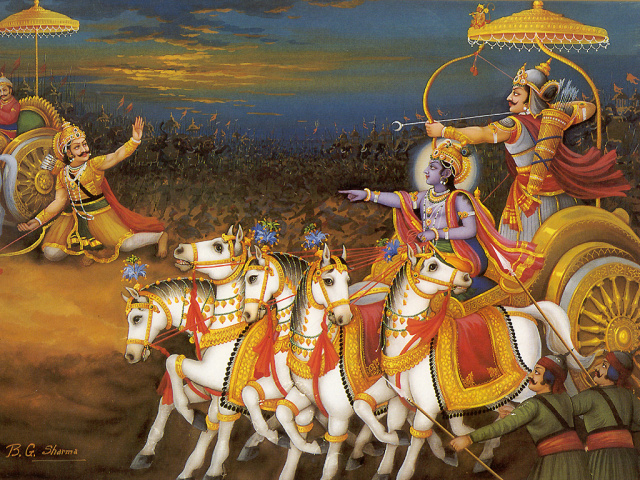 The Bhagwat Gita begins with calling Kurukshetra (the battlefield) as“Dharmakshetra”. So what is “dharma”? Shri Krishna goes on to describe Dharma to Arjun as “righteous duty”. As a Kshatriya, it was Arjun’s duty to remain on the battlefield and fight the enemy. Krishna even asks Arjun how at this hour the illusion (of running away from the battlefield) struck him? The purpose of setting out what Dharma is or rather ought to be is to comment upon the extremely distorted & politically convenient connotation the word has achieved. With the evolution of time, various sects evolved world over. To call such sects as “religion” is an anomaly in itself! The present situation or atmosphere of disallowing dissent of any sort is a dangerous development which our country has witnessed over the past 5-6 years, with ease of access to mobile phones, social media and the internet in general. Every scientific invention has two sides to it -while the internet is something which has completely revolutionised information & technology globally, it now appears to be a double-edged sword which has the potential to cause damages at various levels. Ours has been a civilization which has historically allowed dissent. I am reminded of a crippled Ashtavakra who could just walk into King Janaka’s court and challenge his most celebrated scholar on shastras, Bandi. Ashtavakra was laughed at because of his physical condition but once he defeated Bandi in a debate, King Janaka bowed down to him and requested Ashtavakra to teach him the mysteries of life. Or take the example of Karna who openly challenged Dronacharya’s best pupil Arjun in an open arena. Despite killing Ravana’s son Akshay Kumar, it was felt that Hanuman should not be killed because he is a messenger of his master! It has been a civilisation which has accepted contrary views rather than discarding them. Our civilization has been inclusionary and not exclusionary. I very much second Justice Markendeya Katju when he says that ours is a “Sanskrit-Urdu” culture. I personally have had the privilege of growing in a household where on one hand Valmiki’s Ramayan was perhaps the most revered book - where Lord Ram was revered as an epitome of principles and considered a perfect example of an ideal son while on the other Mirza Ghalib’s Bazicha-E-Atfaal hai duniya mere aage was also wholeheartedly accepted. While the humour of P.G Wodehouse was adored, the depth of Sahir Ludhianvi was also talked about. It was (and is) a household where Kafka, Harishankar Parsai and Saadat Hasan Manto were talked about with equal vigour. My father had this amazing capability of enjoying (or rather accepting) two completely different ideas with the same zeal or neutrality. If this is termed as being “liberal”, I have no qualms about being called one. Recently, noted author & novelist (!?) Chetan Bhagat wrote an open letter wherein he alleged that liberals are those who belong to a privileged class of society, go to luxurious & expensive schools, have ‘hot dogs’ for lunch and dinner and so on. That I don’t read Chetan Bhagat and don’t consider him to be someone worth reading is my opinion, however, his understanding of being “liberal” is completely flawed. We as a country are (or rather were) essentially liberal and it has got nothing to do with the school we went to or the food we ate. On the other hand, we do have a so-called “urban elite” class which talks about political theories and concepts, purport to be the ideologue of the masses. However, till now the urban elite was not ready to let the masses speak their mind. Why? Because the urban elite had the language! The venom that is being spewed on the social media today is a juxtaposition of a flawed understanding of being liberal and also the regression that the not-so-liberal-and-elite have faced. Now they have a medium, a platform and there is no one to control their voice (in fact it is being encouraged). Therefore, the result is to abuse one and all including women and increased use of words such as presstitutes, libtards, commies. It is also a reflection of their mindset. It appears that battle-lines have been drawn and whosoever has a contrary political opinion or raises a voice is suddenly on the other side of the wall. There is just black and white and no grey. “Constructive criticism” is a concept long forgotten. We belong to a civilisation where a cow had the potential to turn an angry, greedy and egotist king into a supreme spiritual master. It is believed that while still a King, Vishwamitra was amazed at the powers of the cow Kamdhenu, using which Sage Vashishta fed Vishwamitra and his army. Vashista battled with Vishwamitra to get the holy cow but was defeated because of sheer spiritual veneration of Vashishta. Vishwamitra vowed to acquire spiritual powers which would make him great. Eventually, Vishwamitra became a “Brahmarshi”. Today, self-proclaimed cow protection groups are lynching and killing people in the name of the cow! I support vegetarianism and do not fancy the idea of killing and eating animals. But that certainly does not give me a license to lynch and kill people. The ideal way to put forth this view is to increase awareness and tell people about the probable ill-effects of eating animals. The notion of nationalism, it appears is under a siege. A straight jacketed formula is given and anything and everything outside that formula is considered “anti-national”. So if I say that it’s absurd to compare a soldier with someone standing in a line to withdraw money from the ATM, I automatically fall into the “anti-national” bracket. If I question one step of the ruling disposition, the ones supporting that point of view will quickly quip “what about the last government”? Whataboutism is another thing which has grown manifolds and it is abundantly visible and available on the internet. Online abuse is something which will only grow in magnitude but what worries me is the standardization of the entire concept of liberty. The National anthem, soldiers, Pakistan and now arts & cinema are few things which have become linear topics and concepts. There cannot exist, a view contrary to what is being dispensed by the ruling disposition and the so-called right wing. Take, for instance, the case of the national anthem. Ever since my childhood, whenever it is being played, I automatically stand up and also request those around me to stand. But suddenly, I am being told that I have to stand up, even if it is a 9-12 show of a movie. If someone tries to find logic in it, you are termed as “anti-national”. We will try and delve deeper into the complexity of the so-called outrage that has captivated the country and the likely consequences which one can expect in the times to come. Mandatory Disclaimer: The views and opinions expressed in this article are the guest-author's own and do not necessarily reflect the views of the blog's primary author. Vijay Purohit blogs at The Narrative.